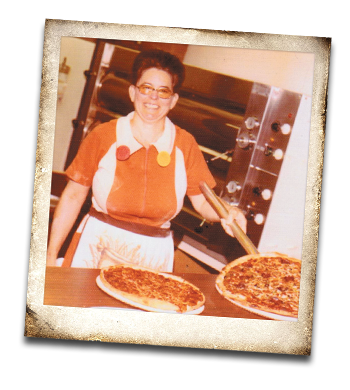 The history of Jo’s Famous Pizza began back in 1962 at Cha’Ray’s Pizza in Purcell, Oklahoma. The owner, Mrs. Rhodes, also had a pizza place in Ada and Pauls Valley and needed a manager for the Purcell location. Jo was between jobs at the time and her brother, Dwight, told Mrs. Rhodes that his sister would be perfect for the job. When he got home that night he informed Jo that she had a job and needed to show up the next day. Jo reluctantly showed up (she wasn’t sure she wanted to cook pizzas for a living) and Mrs. Rhodes showed her brand new employee (who had never even eaten a pizza before) how to make just one pizza before she was on her own…and that’s all she wrote…well, kind of. That single pizza Jo learned how to make just happened to have bell peppers on it. So naturally, Jo thought all pizza on earth included bell peppers! For a couple of days Jo cooked every pizza the same way until it dawned on her when a frequent customer asked her to please leave the bell peppers off! The original pizza place was in a small concrete block building and when Jo bought the business from Mrs. Rhodes, “Jo’s Pizza Hut” seemed to be an appropriate name to call it. However, she soon received a letter from the Pizza Hut Corporation in Wichita, KS claiming rights to the name. The name was changed to JO’S FAMOUS PIZZA. Well, maybe it wasn’t “famous” in the real sense of the word, but it was famous in Purcell, OK. She stayed open until midnight during the week and until 2:00 am on Friday and Saturday. There wasn’t much else going on in Purcell, OK at the time, especially for the teenage crowd, so it became the late-night hang out. The one juke box and one pinball machine stayed very busy, plus the teenagers ate a lot of pizzas. In 1978 Jo’s Famous Pizza moved just down the street to its current location in Purcell, Oklahoma. On Christmas Eve of 1987, Jo’s Pizza tragically burned to the ground due to an electrical fire. Jo put up a sign informing the public that she would reopen on July 1, six months after the fire. She kept pushing the contractor to get finished on time because she had to keep her promise. She and her crew were there mixing dough, shredding cheese and getting ready while the workers were putting the finishing touches on the building. After a six month wait, the public was ready for a Jo’s pizza and on the day she reopened, the cars were lined up down the highway waiting to get in. In the beginning, Jo did not open for business until 4:00 pm. During the day she and her mother, Thelma, would go the pizza place and mix the dough, make the dough balls, shred cheese, and prep the vegetables. She would come home, put a clean uniform on and go back to work until closing. Most of her nieces and nephews worked there through their high school years, and one of her nephews, Rodney, managed the place for her for several years. Jo is no longer involved in the day-to-day operation of the business, but her family strives to maintain her high standards. In 2008, Jo’s sister, Kathy, moved back to Purcell to live with Jo (who is 16 years older than Kathy) and got involved in the business again. Kathy started working with Jo from the very beginning in 1962 while she was in high school. For almost 10 years they were a dynamic duo delivering that special touch to every single pizza! Today, Kathy has picked up where she left off over 40 years ago never missing a beat, keeping that special touch. And now, Jo’s Famous Pizza has expanded and opened up restaurants in Edmond and Oklahoma City (all owned by Jo’s nephews)! Since that time of handmade and hand-rolled dough, and even hand slicing their own pepperoni, equipment may have made the preparation easier, but the recipe has remained the same. Another thing that remains the same is the quality of pizza Jo’s offers… with the finest and freshest ingredients available!